Rolls back (undo) any uncommitted changes. Skips the undo phase so that uncommitted or incomplete transactions are held open. This allows further restore stages to carry on from the restore point. When applying this option, the database will be in a norecovery state and inaccessible to users. The database will be in standby state and therefore available for read operations. You can also provide a standby file with uncommitted transactions. 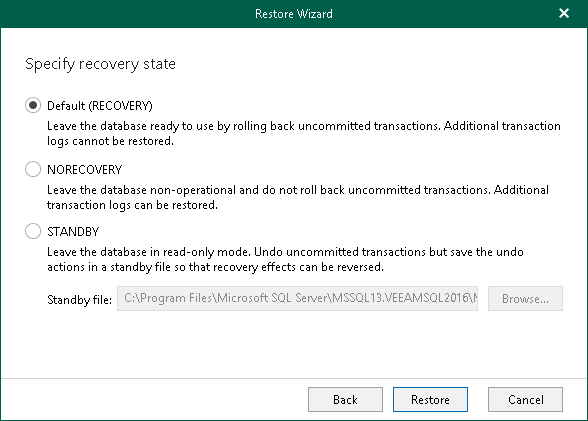 For more information on recovery modes, see this Microsoft article. This step is unavailable if the Add the database to the following group checkbox is selected at the Specify AlwaysON Restore Options step.